A drop in your heart rate after you finish exercising is to be expected, since working out elevates your heart rate. But if your heart rate drops while exercising, or remains elevated after you’re done, you could have a cardiovascular problem that warrants medical attention. 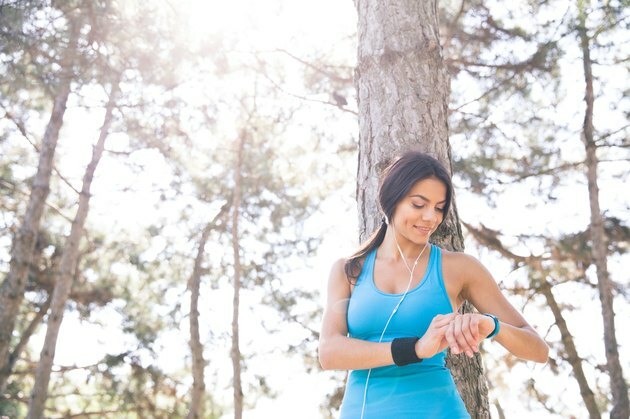 If you experience any sudden changes in heart rate during or after exercise, you should share this information with your doctor and find out what is considered a safe range for you. Syncope is a medical term that refers to fainting or losing consciousness, as a result of reduced blood flow to the brain and a reduced heart rate. Dehydration, exertion or even emotional stress can trigger vasovagal syncope. And even if you don't faint, those triggers can cause your heart rate to drop. Mild vasovagal episodes are often brief and when you recover, your heart rate will become elevated again. If you have multiple episodes, tell your doctor. Treatment may include beta blockers or other medications or techniques to help you avoid vasovagal triggers. Cardiac arrhythmias, abnormal heart rates, can cause major fluctuations during and after exercise. One type of arrhythmia, called atrial tachycardia, is characterized by lightheadedness and a drop in heart rate, as well as an especially fast heart rate that starts in the heart's upper chambers. Medications may be enough to treat the condition, though radiofrequency ablation may be required. This is another type of arrhythmia, more common among young people. It also involves a very rapid heart rate, often brought on by exercise, but some times precipitated by a drop in heart rate before the palpitations begin. The fast heart beats can continue after exercise ends, though with water, rest and techniques such as closing the nose and mouth while trying to breathe out, the episode can come to a close. Ablation is typically the way to treat this abnormal heart rhythm. To help avoid heart rate problems, get a stress test with your doctor to find out the state of your heart health and your readiness for exercise. Also, drink water before, during and after your workout and pay attention to any feelings of dizziness or lightheadedness. Sit down and tell someone that you're having these feelings. Don't try to keep exercising if your head and/or heart are telling you to take it easy.